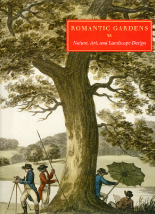 This superbly illustrated book accompanied an exhibition (May 21–September 5, 2010) developed by the Morgan Library and Museum in partnership with the Foundation for Landscape Studies. It contains a comprehensive essay on Romanticism by Elizabeth Barlow Rogers and approximately one hundred catalog entries by her co-curators John Bidwell and Elizabeth Eustis. The authors trace the Romantic movement from its seeds in the early eighteenth century, when Alexander Pope issued his famous imperative “Consult the Genius of the Place in All,” to its full flowering in the nineteenth century. Exploring shared aesthetics and ideals in literature, art, and landscape design, they draw on the Morgan’s rich holdings of manuscripts, drawings, watercolors, and printed materials along with important items from Rogers’s rare book collection. In particular, by spotlighting key works – among them two of Humphry Repton’s autograph “Red Books”; a first edition of Jean-Jacques Rousseau’s romantic novel Julie, ou, La Nouvelle Héloïse; Caspar David Friedrich’s Moonlit Landscape; and Frederick Law Olmsted and Calvert Vaux’s original pen-and-ink drawing of Central Park’s “Greensward” plan – Rogers, Bidwell, and Eustis examine how new attitudes toward nature were variously expressed in England, France, Germany, and America during the period between 1700 and 1900.